Shampoo: Work the texture between your hands. Apply to wet hair and massage. Rinse off. Conditioner: Apply to damp hair, massage onto lengths and ends. Leave in for 2-3 minutes, emulsify and rinse thoroughly. Developed for use before shampooing, but can also be used after cleansing if preferred. My hair was looking damaged from midlenghts to ends due to weather and colour damage , I could never get a comb through it due to my hair type matting when wet. Within a week of useing this product my hair now looks fabulous, its so much more healthy, it feels great and looks great! Tip you only need a small amount on your hair. I’ve used these products for around 18 months and they have made a huge improvement to the state of my hair. I have had my hair bleached for 17 years now and these products kerp my hair from being distressed and dehydrated. 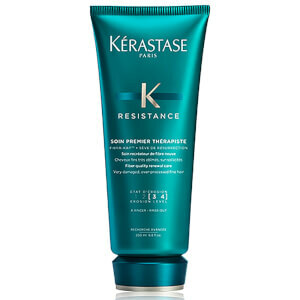 This is for me without a doubt the best line of Kerastase, I have gone from bluish black hair to orange, I had to bleach 3 times and this line has made me a miracle in my hair, now it looks very nice and healthy, I recommend 100% and I recommend buying in lookfantastic, fast delivery and real products. 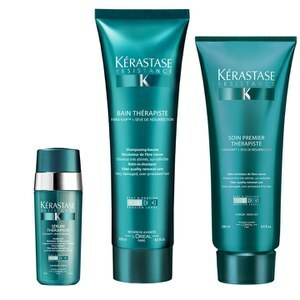 As a first time buyer of Kérastase products, I took it for a given that the "conditioner" was a conditioner. It's not, it's used before shampooing, which was just a waste of money for me and I found it did very little for me (I should have read the description properly).The shampoo however is amazing and my hair is in such a better condition after a few months use, after years of bleaching. I've been using these products for two weeks now, absolutely amazing results. For the first time I don't have use any products to style my hair. Hair is nice and silky and smell is amazing. I'm definitely buying again. Before I was a big fan of Kerastase Chroma Riche, but since I tried this one - I'm in love with it! I like how it feels and looks, highly recommended! I have highlighted hair, get greasy in roots very quickly and quite dry at ends, so I wash my hair every day. 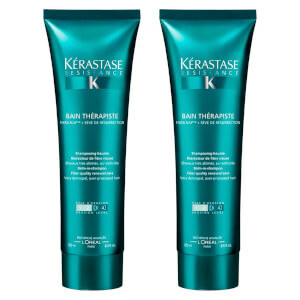 I’ve purchased this two after burning my hair with bleach .It needed a haircut definitely.I did that and used this two.My hair never looked better.Does a great job.My hair is shining and looks healthy.I can pass my hand through it so easily.Its a must have. Unfortunately this product doesn’t work for me. It makes my hair greasy. I washed my hair the night before and the next day I had to use dry shampoo to make it look less greasy. I have been blonde now for 5 years, and get full head highlights every 10 weeks at the Salon. My hair itself is pretty damaged from this and does not seem to grow grr. I used to use normal shampoo brands on my hair but it felt so horrible to use. 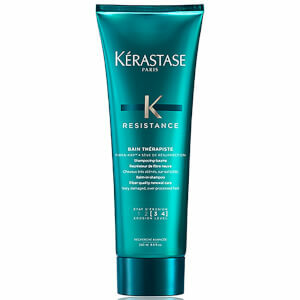 Since upgrading to Kerastase, two years ago it seems to be the only shampoo that makes my hair feel nice and soft whilst i wash it i also love the smell. The shampoo and conditioner is extremely thick and feels very nourishing when you wash it. Due to the price of the brand i have tried to experiment elsewhere most recently with Redken Extreme. Redken does not come close, i couldn't even finish the bottles because it was making my hair feel so coarse and dry whilst washing it. Therefore i do warn you, make sure you can afford this shampoo regularly because there is no going back for me now. I also wash my hair every day (i know i shouldn't) but will normally go through a bottle at least once a month. On top of this shampoo i also own the masque which is amazing. I do own Redken's CAT treatment too and Moroccan oil, therefore i do everything i can to keep my hair healthy. However i do have to say this shampoo is not a miracle, so do not expect a miraculous recovery- its much better for your hair, feels alot better than any other shampoo but unfortunately will not cure all the damage to dyed hair. I still rate it as the best shampoo and Conditioner out there: My Hairdresser also rates it highly too. I do recommend using this, along with the masque applied once a week - on top of this using the CAT treatment by Redken and Moroccan Oil is making my hair shiny and a a lot healthier.